I shall climb Ben Nevis. In a pair of Doc Marten boots and Primark gloves, with no training done or experience under my belt and only a Tesco sandwich in my backpack, I decided today was the day I would climb Ben Nevis. 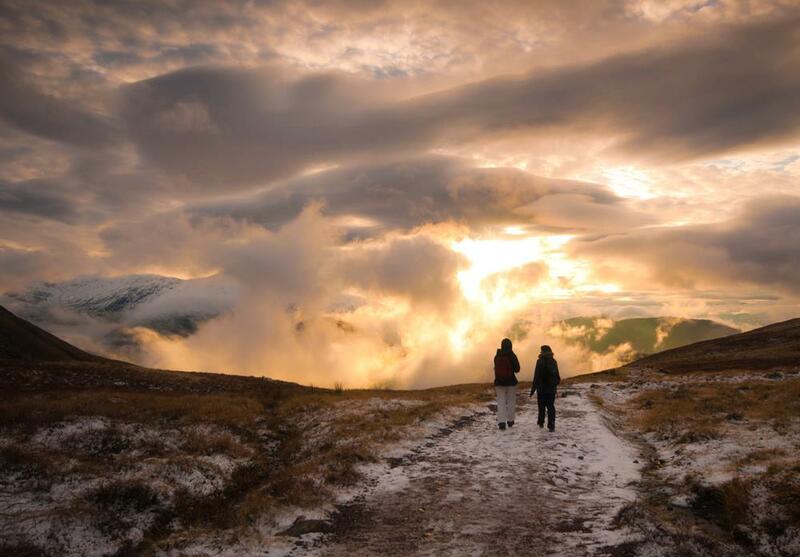 At 6am, I boarded a minibus tottering with strangers and gear and off we set on a three hour journey across Scotland to the base of the UK’s tallest mountain. At half past nine I put one foot in front of the other and began what I thought would be a pleasant stroll up a big hill. Three steps in and I was peeling the clothes off me, sweating and nervous about my tendency to assume that I can do anything as long as I keep moving. After the uncomfortable pleasantries of introducing oneself to the group, I fell into a thoughtful silence and shuffled onwards. It is never until the going gets tough that boundaries break down and people start to open up and share their stories. An hour and a half into the hike, the snow appeared, the hats came out, the gloves came on and we talked to break the monotony of our thoughts and to forget the twinges of our muscles as they began to protest. One German, four French, one or two English, one Swiss, several Scots, and one Irish hiked our way upwards, single file, mostly in silence, lost in our thoughts and the blissful scenery that held us in place. One hour to the summit and all we could see is white; snow and fog embedded us. If our leader didn’t know the route off by heart, we would be lost forever and all I had was a Refresher bar for nourishment. The group split, with the latter one slowing and ready to potentially turn and head back to base. I was stubborn, I could keep up with the speedy fuckers. But as time elapsed, I felt my body slow. I was not keeping up, I was tired, I wanted to abandon, to turn back but if I did everyone would have to. So I dug deep, it killed me to do so but It would forever haunt me to make others abandon due to my weakness, so in my boots that were built for fashion not for climbing I dug my way onwards. Falling often, sliding backwards on the ice, frustrating the group with my pace. But they were kind and patient and they encouraged me onwards. And eventually, when all I could see was vast whiteness I stepped upon level ground and one of the hikers turned to me and said “Guess where we are?” “Where?” I replied, sagging on the precipice of defeat. “We are on the summit.” he smiled and hugged me. ;D Cheers! Just had a quick look at your blog, your life looks pretty awesome! 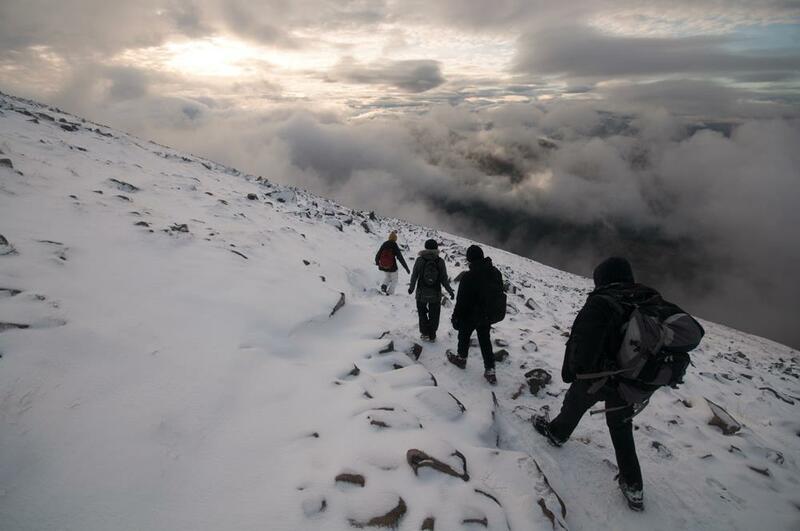 I loved reading this article on your journey to climb Ben Nevis. I would love to ask you a few questions on this article. We can conduct the interview through email or phone. My deadline is tonight at 6pm. para conseguir ese ” equilibrio perfecto ” entre facilidad de uso y atractivo visual . rápido para mí en Firefox . Superb Blog !